Now I feel like I need to say "Thank you" for the thank you notes and gifts! My husband brought home pictures and notes and gifts from our friends in Central Asia. Here's a peak for you! The girls with their quilts! Their parents made the girls write me thank you notes! I appreciate it, and I appreciate the work it took for mom to get them to write them! I know because I would make mine write thank you notes as well, especially after Christmas presents - and I can't say mine were super excited about it - but we did it. - always on the 26th! The quilt and pillow covers were all put together with a tablecloth and then our two American families gave it all together. That's what you are seeing on top (the tablecloth). 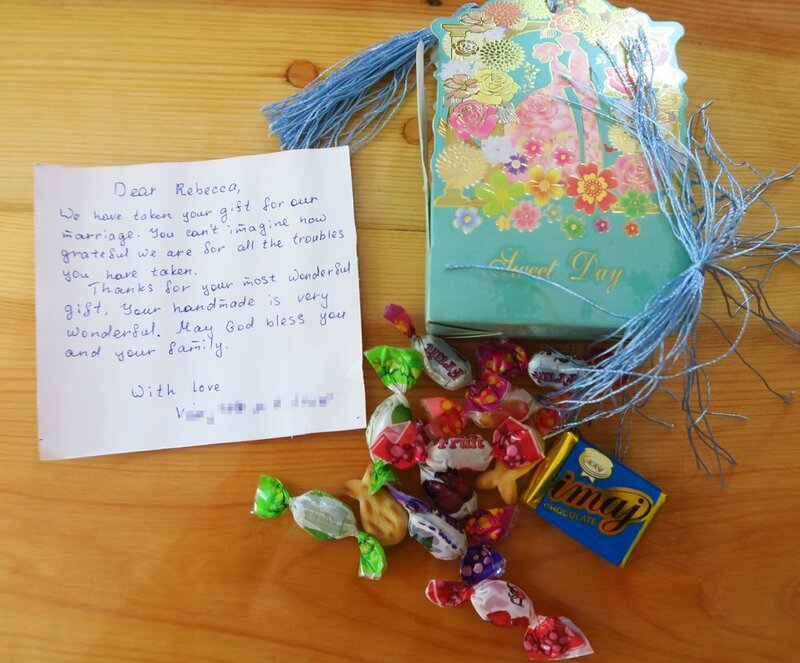 The thank you note and candy she sent to me was so sweet! I appreciated it very much! And just because we women usually like to look at wedding pictures - here is a group - not sure who everyone is, but you can tell who the bride and groom are anyway! These (people) pictures came from my husband and he told me it was fine to put them up. And then I got candy and a nice folk design purse shown above under the words "Thank You" from the mom of the girls! So now...do I need to give a thank you for all the thank you candy and stuff? And that's what's been happening from my part of the world! At least with regards to my sewing room/world! Be sure to check out what my sis for you in the store! She's busy trying to get you new and exciting fabrics every day!